We fight it. We work very hard at avoiding it. We deny we have it. We feel terrible about it when we do have it. Yet everybody struggles with Doubt. What makes us feel even worse about it is we know Jesus rebuked His disciples when they let their doubt squelch their faith (Luke 9:41). We know that without faith it is impossible to please God (Hebrews 11:6). We are told to beware of “an evil heart of unbelief” in departing from the living God (Hebrews 3:12). This is serious stuff. Gee whiz, even “the unbelieving” tops the list of those who end up in the Lake of Fire…even before the murderers, the fornicators and the sorcerers (Revelation 21:8). There is no way of getting around it. We are saved by faith, we are sanctified by faith, we are filled with the Spirit by faith, we receive healing and deliverance by faith. Faith is so important that Romans 14 ends with the statement; “For whatever is not from faith is sin”. God chose faith as His way of interacting with us humans without infringing on our freewill. Ever since our forefather Adam willfully chose to eat of the Tree of Knowledge, his bloodline, his offspring has been infected with the sin-virus of an independent inclination and defiance towards God. Today we simply call it pride or self-sufficiency. Therefore through Jesus, God restored the opportunity for us to have relationship with Him through the free-will agency of faith. We have a choice to choose Him and His will for our lives every day, without being forced to comply. So why do I say there is beauty in Doubt? Because there is an aspect of doubt that is truly wonderful to ponder. It reveals the wisdom of our God. You see, without the possibility of doubt we would be preprogrammed robots. Without doubt we wouldn’t truly have a free will, and if we didn’t really have freewill we wouldn’t be created in the image of God. It is an amazing thing that God actually created billions of people in the same image of Himself. The presence of doubt should remind us we still have a choice in every circumstance. Doubt reminds us we are back in the Garden and have a free will to choose God’s way, our way, or the world’s way. This presence of Doubt is a reminder of our freedom. However it can be disconcerting at times. Kierkegaard described it well when he said “Anxiety is the dizziness of freedom.” Doubt presents us with alternatives to the will of God. Some of those alternatives are difficult to choose from because the choice may cost us a lot. Let me leave you with some closing thoughts about Doubt. #1 – Certainty without the possibility of Doubt is not a good thing – Wouldn’t it be great if Adolf Hitler, Charles Mansion or today’s Islamic terrorists had a little doubt about their belief system? Isn’t their certainty a scar on humanity? What about the Pharisees? Their self-assured, self-righteousness ended up snuffing out the life of Jesus…which they still do today. People sometimes forget that the apostles of the Lord sometimes stated the will of God in terms of something that “seemed good” to them and the Holy Spirit (Acts 15:25, 28 and 34). I love the humility in their words. #2 – Don’t freak out when Doubt comes. If a bird flies and lands on your head that’s not your fault. However if it builds a nest on your head you have entertained your doubts way too long. We need to remind new believers if doubts come against them it’s not because they are failing at Christianity. 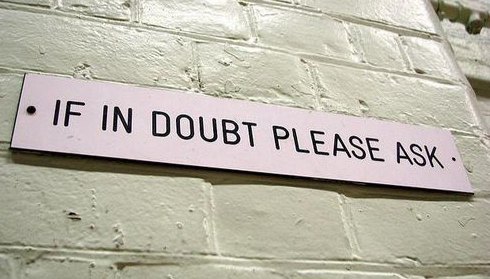 Doubts enter into everybody’s mind, especially right before an important decision or situation in their life. We aren’t helpless before these doubts. #3 – The presence of Doubt means you are still alive. You are still a freewill moral being with the power to choose. Nobody has preprogrammed you. You are still on the journey of life if you wrestle with doubt. You have options. In fact, it is the very 50-50 decisions we are forced to make; the ones where we aren’t really clear what we are to do; when our intellectual abilities are exhausted, that we must depend on our “gut”, our faith. It is in this crucible of “choices with consequences” that our faith and our inner person, which was created in the image of God comes forth as refined gold. 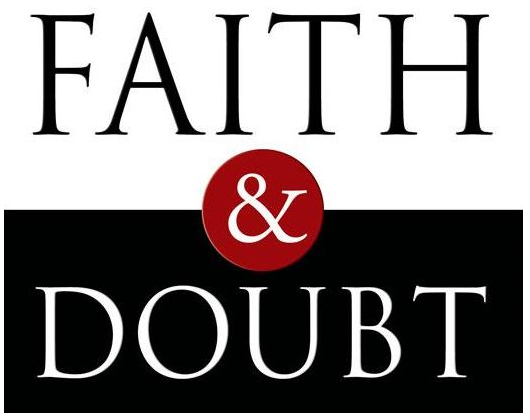 #4 – Doubt doesn’t mean you don’t have faith, you may have just misplaced it. The story of Jesus and His frightened disciples on the stormy sea (Luke 8:25) caused Jesus to pose an important question to them; “Where is your faith”? Jesus wanted them to think about where they placed their faith. They (like us) probably allowed their fearful circumstances to push their faith down into a corner of their soul. Yet it is still there. Jesus is reminding them (and us) to get our faith out and use it again. So the next time you are fighting the fight of faith, remember that the presence of doubt doesn’t mean you are a weak person or you are a hopeless cause. The little faith you do have, even if it is the size of a mustard seed, is enough to remove every mountain in your way. In the end you can also remember… you can doubt your doubt. Posted in Most Popular Articles and tagged Discernement, Doubt, Faith, Jeff Krall, Soren Kierkegaard, Trials on December 29, 2013 by Jeff Krall.